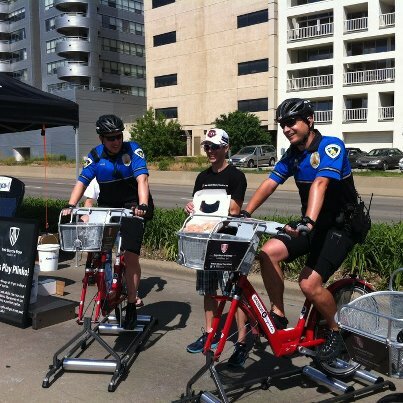 Throughout the summer, on the first Tuesday of every month, Madison B-cycle, Whole Foods, and one local business will be hosting B-healthy B-happy Hours. From 4:30-6pm, we will be at one of our B-Stations around the city providing health conscious activities, information on local businesses, food, and drinks to all participants. These events are meant to promote living a healthy lifestyle and enjoying local Madison businesses. Our first BHBHH event was June 5th at the John Nolen and Law Park B-station. Whole Foods provided a delicious variety of snacks and refreshing drinks. Mats were provided by The Studio, where instructors were able to give free tips and run through yoga exercises, specific to each individual. 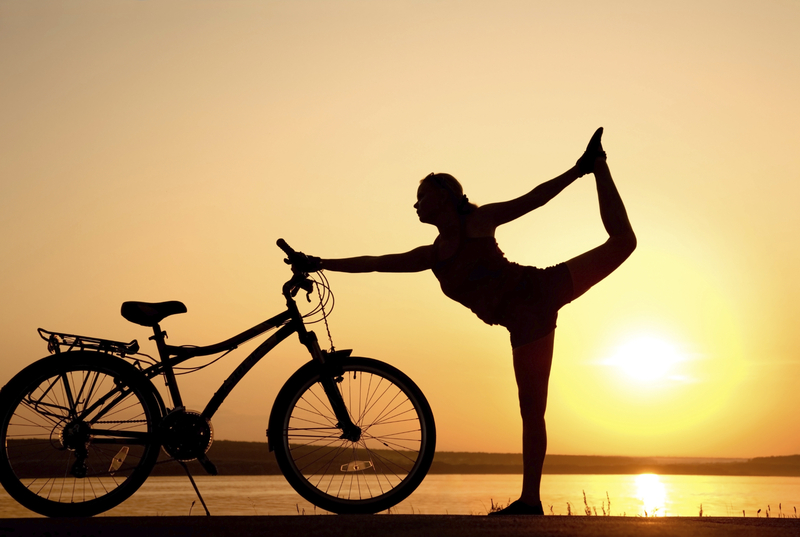 Groups of people learned how to incorporate simple yoga poses and breathing techniques into their everyday fitness routines. The Madison B-cycle bike sharing program celebrated one year of operation by offering free 24-hour memberships the day of Madison’s Ride the Drive event, Sunday June 3rd. Thanks to the program’s title sponsor, Trek Bicycle Stores of Madison, users who took advantage of the free ride offer only had to cover usage fees for trips lasting longer than half an hour. To take advantage of the free 24-hour pass, users simply registered at any B-cycle station or online at madison.bcycle.com. At the Ride the Drive location on John Nolen Drive, Madison B-cycle and The Trek Bicycle Store of Madison hosted a range of family-friendly activities, including a bean bag toss, speed challenge races on B-cycles, and an obstacle course. Participants who rode B-cycles to the Trek store of Madison space got VIP access to play for prizes on the B-cycle plinko board, and cake to celebrate the program’s one-year anniversary. Madison B-cycle offered free bike trips during the Wisconsin Bicycle Federation’s Bike to Work Week, May 14th through 18th. Free B-cycles provided easy access to two-wheeled transportation in hopes of getting more people riding bikes for short trips in and around Madison’s downtown. The cost of a 24-hour membership was waived at all of the B-cycle kiosks during the week, making all trips lasting less than thirty minutes free to all. Bike commuters were able to get an overview of the B-cycle program while enjoying complimentary coffee and bagels. Bike to Work Week offered the oppportunity to try out the red bikes during morning evening commutes. Parking farther away from downtown Madison, and taking a B-cycle the rest of your commute, avoids the hassle of downtown vehicle parking. “It’s also a great way to try out new restaurants people wouldn’t have time to walk to on a lunch break, or just to get out and stretch the legs during the day or after work,” noted Claire Hurley, Madison B-cycle Manager. 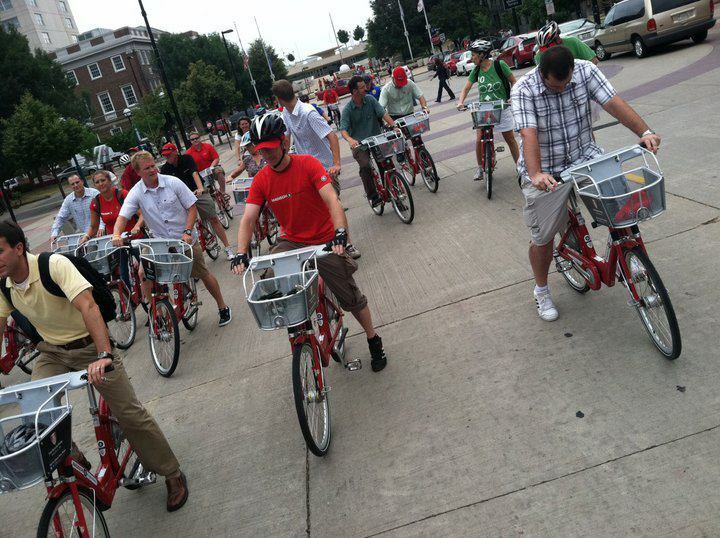 With gas prices projected to continue to rise throughout 2012, Madison B-cycle, Madison’s city-wide bike sharing system, will be lowering its daily membership fee to $5 while keeping annual membership fees flat. As part of an ongoing partnership between Madison B-cycle and the University of Wisconsin-Madison, $20 Annual Memberships are now available to all UW Students, Faculty and Staff. This special pricing is sponsored by UW Transportation Services. Madison B-cycle has four stations located on the UW campus sponsored by UW Transportation, UW Athletics, UW Housing and UW Health. The station locations make it quick and convenient for students and staff to go by bike from dorms, classes, and meetings across campus. With its new lower pricing structure, B-cycle will be among Madisonian’s most affordable means of transportation. Along with the reduced price comes the removal of the week-long membership, which proved unpopular with members. Madison’s 270 iconic red B-cycles will begin returning to the Madison landscape April 1 with eight new station locations planned across the city for 2012.“We feel that B-cycle’s true impact will be made if we continue to focus our efforts on making the system more readily available and more affordable for more people,” said Madison B-cycle’s Claire Hurley. “The changes we have made for 2012 are directly based upon feedback that our users have provided us with.”B-cycle’s mobile app is available now and provides real-time bike availability and nearby station locations based upon a user’s geographic location. The app is available on the Android and iPhone mobile platforms and is a great tool for any member. Use your UW email address to redeem.